Thank you to Ragan Awards for sponsoring today’s episode. If you’re seeking opportunities to accelerate your career in public relations, you should consider entering a Ragan Award program. Young PR Pros listeners will receive 20% off of entry fees for these three programs using the code YOUNGPR. Visit Ragan.com/Awards to enter today. 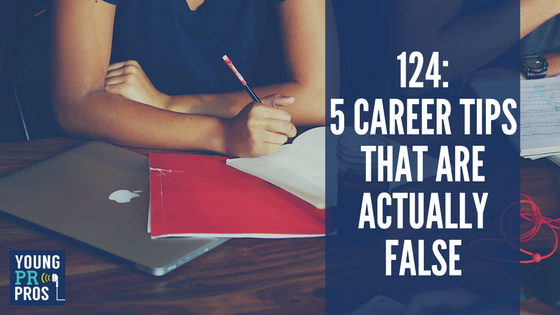 Forbes.com recently posted an excellent article about the 16 common pieces of career advice that are actually false. They had members of the Forbes Coaches Council, talk about some common advice they’ve heard, and why it doesn’t really work. Some examples are no one hires in the summer, a resume must be one page, and do what you want and the money will follow. Myth #1: Personal websites should be strictly business – serious and professional. Professional, yes, but serious – heck no. Be yourself, let your personality shine. Remember, companies hire people – not ideas of people. Myth #2: you need to move to a smaller market to get a better job. Wrong! There are opportunities in every city out there. If you can’t find anything, create it. Myth #3: Only embrace your strength. You can rely on your strengths, but if that is all you do you will never grow. Get out of your comfort zone and work on your weaknesses. Myth #4: do what you love and the money will follow. Okay, so this one is not completely a myth. The market often determines where the opportunities lie. Responding to the market’s needs and capitalizing on it means the sky is limit. But you have to be willing to work for it. And not everyone is. Some just want a job that pays the bills so they can enjoy life. It all depends on what you are passionate about and what you are willing to sacrifice. Myth #5: you need more education to be successful. Education is not a bad thing, but in our industry – in most cases – experience trumps education. Most jobs need a minimum level of education, but really gets you the job is experience. Myth: wear a suit to the interview and you will get hired. If you can rock a suit go for it. You are not comfortable in a suit, that sentiment will rub off in the interview. Be unique and show off your personality by wearing something that is you – of course, always be professional. Myth: when asked in an interview what are your weaknesses, turn them into strengths. Please, please don’t do this. It makes you sound fake and disingenuous. Be honest. Everyone has a weakness, and most of the time, revealing a manageable weakness that you are working on improving shows initiative. Don’t miss out on this month’s Breakfast Club – four articles you should read over breakfast tomorrow. Surviving to Thriving: Why Entrepreneurs Need to Take a Break. To thrive, entrepreneurs need to take a step back from working in their business to think about and focus on their business. This article gives five ways you can mentally re-charge, so you can move your business from the surviving to thriving stage. A tricky question to answer. What am I going to do with my English degree? Caela Fenton finds herself answering that question far too often. Ted Talk How Boredom can lead to your most brilliant idea. Sometimes sitting on a bench and solving a problem in your head is the best way to be productive. When To Speak Up in Tricky Office Situations outlines three of the stickiest situations we face at work and how to handle them. Bonus: make sure you sign up for Crate to get more articles like these on a daily basis. This entry was posted in Young PR Pros podcast and tagged career, career advice, career tips, clare bonnyman, interview tips, job, jobs, julia kent, kristine d'arbelles, professionals, ross simmonds, young pr pros, youngprpros by Kristine D'Arbelles. Bookmark the permalink.